Struggling Macy's is doubling down on its new outlet division Macy's Backstage, with plans to add even more stores to the as yet unproven concept. 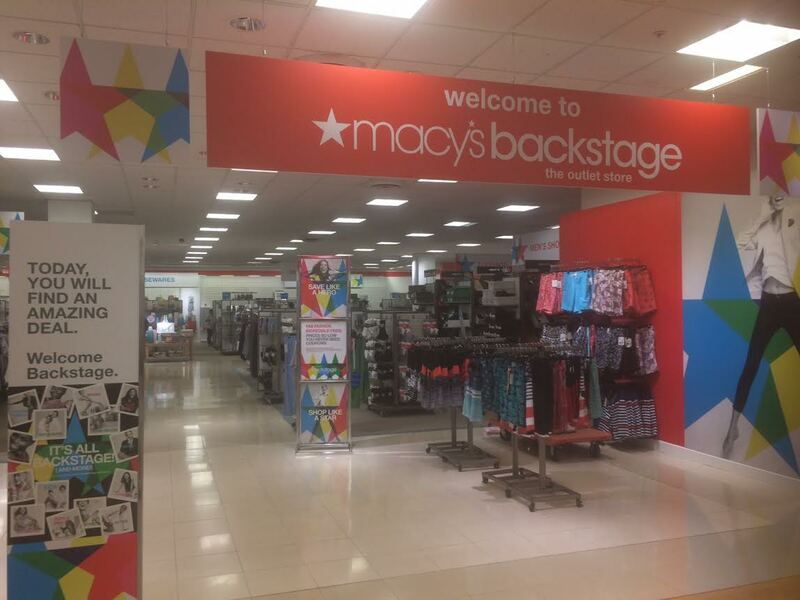 The first three Macy's Backstages in metro Atlanta opened earlier this spring inside full-price Macy's stores at Gwinnett Place Mall, Cumberland Mall and Town Center at Cobb. More recently, Macy's Backstage stores were added to The Mall at Stonecrest in Lithonia and Southlake Mall in Morrow. Most recently, Macy's announced that it will add a Macy's Backstage store to Northlake Mall in Tucker. The store is expected to open in mid-to-late August. The opening of a Backstage at Northlake furthers the idea that Macy's is invested in the mall with no plans to close when the mall is revamped in the coming months/years. Macy's Backstage, which the company has created in an effort to take on the likes of T.J. Maxx and Marshalls, is also meant to drive more traffic to the main line Macy's store. Chicken Salad Chick opened its newest location at Roswell-Wieuca shopping center in North Buckhead yesterday morning. The restaurant, the seventh for local franchise group Origin Development Group and 71st overall for the Auburn based chain, opened in place of what was most recently 521 Kitchen & Que, a locally owned barbecue eatery. This marks the first in-town location for Chicken Salad Chick, with plans already underway to add others in the metro in the coming months and years. New to market men's retailers Hammer Made and UNTUCKit both recently opened on the upper level of Lenox Square in Buckhead. Habitat for Humanity plans to open a new store at Shenandoah Plaza in Newnan. The new store will open between Dollar General and Big Lots in a center also home to a Goodwill. Shenandoah Plaza is located on Bullsboro Drive, a little less than a mile from Ashley Park. The QuikTrip at Shepherds Lane and Briarcliff Road is slated to close by the end of July, at which point it will be demolished and rebuilt. The QT property will grow slightly in size to accommodate the new, building. The adjacent property, once home to Atlanta's CBS affiliate, and before that the Shepherd family residence, will be reduced in size to accommodate the expanded QT. The new QT, which will be the Tulsa, Oklahoma based company's "Gen 3" design, will feature a wider assortment of prepared and ready-to-eat foods as well as an enhanced variety of beverages. The new QT should open late this fall. Another QT is also expected to open this fall on Howell Mill Road on the Westside. While QT continues to develop new sites and enlarge existing ones in metro Atlanta, the company today revealed plans to enter the Austin/San Antonio market with the first location slated to debut next summer. Bowl Lab, a new concept I first revealed would be opening in Vinings last month, is sponsoring a Facebook post this week indicating that they plan to open next week. The new concept, which will offer meat, acai and poke bowls, is opening in the former 1,455 square foot Subway in Vinings Slope near Vinings Jubilee. "After many years," Rooms 1-2-3, the knock-off Rooms To Go at The Prado in Sandy Springs, is going out of business. The furniture and mattress retailer opened in the former Staples at the Prado in late 2015. The Sandy Springs store, referred to by the company as its "superstore," is about 20,000 square feet. Its opening followed the "express" store in Acworth which is located in a freestanding former CVS Pharmacy which is also closing. Both stores are expected to close in September, but perhaps sooner, if all merchandise is sold. Sources say that Staples still holds the lease for The Prado location and that as of now, no replacement tenant has been found. If Rooms 1-2-3 does close in/around September, this space would be an idea location for Spirit Halloween or another similar store. Cheeky restaurant & bar at The Forum in Norcross has been listed for lease by Atlanta based The Shumacher Group. The listing indicates that Cheeky is re-negotiating its lease to $10,000 per month and states landlord is "onboard." "Lease term has almost ten years remaining on initial term with 2-5 year options." "Lease with no key money required other then reimbursement of Landlord security deposit to Seller of $15,000." Last year, Cheeky closed its location at the Avenue East Cobb, after which Tin Lizzy's opened in its place. About the same time, Cheeky opened a new location at Gateway, a new mixed-use center on Roswell Road in Sandy Springs. This week, Gatorade released a new ad with the tagline "Make Defeat Your Fuel." The ad, which features numerous Gatorade endorsers including Michael Jordan, Serena Williams and Peyton and Eli Manning, culminates with Atlanta Falcons quarterback Matt Ryan. The spot is about bouncing back from adversity and disappointment and Ryan and the Falcons' collapse in Super Bowl LI is about as disappointing as it gets for Atlanta sports fans. I'm far more a baseball than football fan, and far more a Powerade than Gatorade fan, but this ad is worth a watch. Unimpressed with Backstage and total lack of execution. I left with no desire to ever give them a second chance and buying nothing. The Backstage concept as it has been executed is a joke. What a mess, no organization, crappy assortment a TJ Maxx wannabe for sure. If you can't do something better than the original you are trying to emulate, than why try at all. If this is all you got Macy's ....TJ Maxx will hands down win this battle. I predict these areas will be pulled out within 2 years. I’m not sure I understand the Macy’s Backstage trend either. Over the last several years it seems like Macy’s as a whole has gone “down market” from staffing, to décor, to merchandise the place just doesn’t look like it once did. Yes, I understand they are hurting and have to do something, but couldn’t somebody at least pick up a broom. Whatever Macy's had been doing already in the way of extra clearance section was a shambles. Nothing was sorted by size so it's impossible to look through it in a meaningful way. It sure won't attract upscale shoppers. Looking forward to a trendy chain restaurant to arrive and bring in that upscale crowd. Are they going to put it up on their unused third floor? I went to the " Backstage" section of Macy's at Stone crest Mall expecting standout products from the store but the selection was disappointing. From what I saw, it seem like they just added more foodstuffs but that's it. There is no wow factor with the backstage concept. I just think that they took some things that was already being sold, got some more materials from their warehouse and put it in the back of their stores to sale. Man..I was expecting so much more.Supposedly,they wanted to be more like TJ Maxx or Marshalls.Hmmm..I don't know..with the stuff being sold at Macy's Backstage you may as well stick with them. Awfully executed at Perimeter Mall Macys. Felt like I was in goodwill. Looks like the Macy's at Avondale Mall before it went under.